Liberal finished one of their most winning home seasons in recent years with a 14-6 win over Hays Wednesday night at Brent Gould Field. The Bee Jays finish 20-5 on their home field and have seven road games remaining. Liberal creates space between themselves and Hays for second in the Jayhawk League with the BJ’s improving to 18-11 in the Jayhawk and the Larks falling to 13-12. The two teams play again in Hays Tuesday. The Bee Jays built a 6-0 lead after four and 12-3 after six. Concordia’s Joe Vaskas homered for the fourth time this season in the third and K-State’s Nick Cocking blasted his second homer over the right center field wall in the sixth. . The Bee Jays plated one in the first, two in the third, three in the fourth, five in the fifth, one in the sixth, and two in the eighth. Edwin Arroyo was 4-6 with four RBI’s, three runs, and two stolen bases. Mark Gomez was 2-4 with a double and three RBI’s. Mike McArthy was 3-4. Paul Gonzalez improved to 3-0 with six innings, two hits, nine strikeouts, and no earned runs. Mike McBride and Travis Parker also worked scoreless innings in relief. 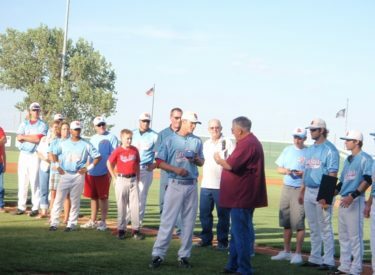 Before the game, Kelby Tomlinson was named the team MVP. The Seward shortstop headed to Texas Tech came into the game hitting .378 with a homer and 23 RBI’s. He has 12 doubles and three triples. The Elgin, Oklahoma native is 23-24 stealing bases. Gary Dearing was named the BJ Director of the Year. His brother Max Dearing played for the BJ’s from 1957-59. The Bee Jays are 26-11 and play Thursday and Friday night at Junction City.